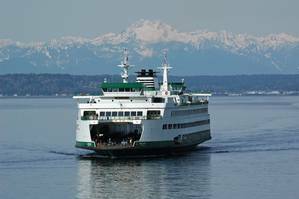 Washington State Ferries has begun a project to transition the largest vessels in its fleet to cleaner hybrid-electric power. The three ferries in the operator's Jumbo Mark II class, the Tacoma, Wenatchee and Puyallup, were built from 1997 to 1999 at Todd Pacific Shipyards in Seattle. Each vessel can carry up to 2,499 passengers and 202 vehicles, making them the largest in the Washington State fleet. The 460 footers are also the fleet's biggest emitter of greenhouse gas emissions. Collectively, the three vessels burn approximately 4.2 million gallons of fuel per year - more than 26 percent of the fleet's consumption. Earlier this year, a study to analyze the feasibility of modifying three WSF Jumbo Mark II ferries to integrate battery power into the propulsion plant was prepared by naval architecture and marine engineering firm Elliott Bay Design Group (EBDG). The study discussed the initial power and energy requirements for each route (Seattle to Bainbridge and Edmonds to Kingston), the sizing of the battery banks, new arrangements on the vessels, impacts to the existing system and life cycle cost analysis, and proved the feasibility and financial justification of the conversions. Several long-term benefits for Washington State Ferries and the impacted region were highlighted, including zero-emission crossings on the proposed routes, major reductions in NOx and particulate emissions after the conversion and near elimination of diesel fuel consumption for the vessels. The study found that the conversion project would have an enormous impact in meeting WSDOT's 2020 emissions targets set by Washington State Legislature and complying with the Governor's Executive Order to transition to a zero-carbon emission fleet. "Hybridization of the Jumbo Mark IIs has the potential to accomplish Washington State Ferries' role of providing safe, affordable, and environmentally friendly transportation across the waters of Puget Sound in a revolutionary new way," said Will Ayers, Chief Electrical Engineer at EBDG. Ayers, who recently toured several European ferry operators to observe hybrid-electric vessels already in operation, said, "We have the ideal opportunity to learn from them and apply such technologies where it makes the most sense." EBDG said it will continue to study vessel electrification closely, especially as this developing technology comes to the U.S.